hardly sold out is it? Fair play to the lads they still look like they’re hip (replacements). In all fairness, Richards looks amazing for a guy who realistically should be dead, whatwith the drugs, etc, also he fell from a tree, whilst ironically he was out of his, whilst the band were recording in Jamaica. Fáilte go raibh, “The Rolling Stoners”. What’s not to love about them? Actually, yes. He’s a modern day miracle. Charlie Watts is dressed as if he’s expected at an important board meeting, rather than play drums for the biggest rock band (arguably) in the World? he doesn’t drive, but he has a huge collection of vintage motors. he gets suits specially tailored and then sits in the cars having a nice old daydream to himself. Or campaigning for a hard brexit. Well Richards was the worst but none of them were angels. 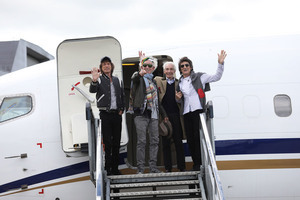 Jagger is 74 and must have a hell of a lung capacity to do a tour like that. I mean they all smoked, and drank to excess, and enough drugs to kill a horse. It does beggar belief, healthy sporty types die before 30, yet? The last time I played Croke Park it was an Under 14 match, 40 years ago. There was no money involved – granted, although I did have to contribute to diesel money for the coach transport, I think it may have been two large, yes £2? “It does beggar belief, healthy sporty types die before 30, yet?” Yes Shayna ALL healthy sporty types die under thirty and ALL people who abuse themselves with drugs live to the age of the stones. Eh, it’s the 14th of May today Bodger. Sorry Lush, fixed now. Thank you. Thursday, May 18 doesn’t exist this year. A legendary band playing one of the worst venues for music, just to make an extra few quid. Their already so rich why not play in decent arena and put on a great show with great sound, since its probably their last tour. Will the comrades decide how much money they should be allowed to earn? Will you also be first in line to gripe about seatwave ripping off fans when they play a smaller venue? Were you high, comrades wtf are you on about. Lenny Kravitz is a lot cooler. Kate Moss even more so. He’s no Christy Dignam. To be fair to Jagger he puts in a lot o physical prep for the shows. Richards doesn’t play his guitar anymore. .so I heard. Ah fair enough. Makes sense. Only reason I ever tuned to open G. Still love the man. Sorry what am I missing here. Did they dig these lads up to play? When was the last time they wrote a hit? When was the last time they even wrote a song? When was the last time they made a Rock N Roll statement or declaration? When was the last time they were relevant ffs???? Today, obviously, because you’re going on about them. No offence JK but couldn’t all those questions apply to the bands you push?.. Modern Medical Science is a hell of a thing. Surely this is their last tour though? Driving along Clonliffe Road earlier with the window rolled down and I heard them rehearse. Sounding good! Seriously? This is staggeringly dull stuff – up there with Garth Brooks and Chris Rea concerts. 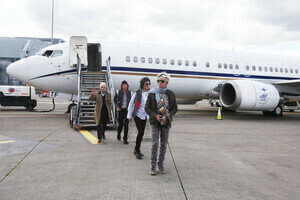 At least Aerosmith look good.